At the news of the death of Margaret Thatcher my country was instantly split between those who had remembered life under her during the 80's and those who probably went "who?". However even the second group of people took the chance to party and riot like good little Englanders all around the country. For those of us old enough to remember her and her governments time in office it was a choice between respectful mourning of a great Prime Minister, whether or not you agreed with her policies, or a chance to celebrate the death of someone who had brought great misery to large parts of the country. For those people living outside the South East of England during the 80's it was a time in which skilled workers lost their jobs and the only replacements were service based such as IT, Sales, Marketing and other forms of employment that someone without a degree could move to unless they wanted to serve burgers in McDonalads or say "Hello" and "Goodbye" at the local B&Q. The rest of Europe used to call the UK the "sick man of Europe" during the end of the 70's and it was a time of 3 day working weeks, power cuts, IMF bailouts and rubbish piled sky high and left in the street for rats to fester in due to regular militant union action. Maggie Thatcher came into power in 1979 determined to smash the power of the unions and she did so using new laws and the strikes led by Arthur Scargill and the National Union of Mineworkers during their famous strike of 1984 to 1985. Scargill whose wife on news of Thatchers death called her "evil", claimed that the government had a long-term strategy to destroy the mining industry by closing unprofitable pits, and that it listed pits it wanted to close each year. Although the Government denied this at the time it didn't stop the massive strike action that led to famous battles such as those at Hatfield and Hunterston between miners and soldiers dressed up as policemen where blood was shed on both sides. Although Arthur Scargil was a communist sympathiser and had links to the Soviet Union at the time; quoted as saying that "the ideas of Marx, Engels, Lenin and Stalin explained the real world". He was demonised by the Tory press and ultimately failed in his attempt to stop Thatcher shutting down the mines. This led to the wastelands of the North that weren't put right until very recently and whole towns were put on the dole. The cost to the taxpayer that came from the huge unemployment in these towns with the social ills related to it far outweighed any subsidy that would have been needed to keep the mines open and proud men in work, paying tax and supporting their families through hard work. Although the Miners strikes were held during a time in which there was a real choice in UK politics, between those people who wanted real left or right wing policies, and had their parties to vote for that upheld those views. With Labour on the left and the Conservatives on the right. The era of Maggie Thatcher led to the rise of the neo-Thatcherite, Tony Blair, who once elected as leader of the Labour Party took it to the centre ground and abolished a major part of it's core belief i.e clause 4. Clause 4 of Labour's constitution committed the party to nationalisation (or re-nationalisation) of the key industries and utilities. As Thatcher was privatising everything she could, even at rock bottom prices. There was still hope for those people who believed state built industries such as the railway should be owned and run by the state for the benefit of the people NOT private shareholders. We can all see what a mess the railways have become with ever increasing price rises due to the lack of any "real" competition. Can someone tell me how can two competing train companies run trains on the same line at the same time? If not then how would privatising the industry have any hope of bringing fares down due to competition between competing companies? "Well, Margaret Thatcher is perhaps the politician I have the greatest admiration for. I am reading her memoirs at the moment." Not exactly the thing someone who is supposed to be your opponent across the political sphere would say. Especially about the one person who probably did the most to change UK politics in the last 30 years and remove all "socialist" tendencies from your own party - a party that was supposed to be socialist and pro-trade union in nature when it was founded! Then again there are rumours from ex MI5 agents, including the well known whistle-blower David Shayler, that Tony Blair himself was an MI5 informant who was recruited at University to spy on the very left wing radicals he pretended to be part of. If true was it any surprise that his rise to the top of the Labour party was so quick and that once he became leader he quickly removed any semblance of socialism from it? These were the same industries that Thatcher was busy privatising and whilst her policies put many people out of work it also modernised many UK industries and gave the UK an advantage over it's European allies, many of which still have nationalised industries to this day. However although many people remember her as being euro-sceptic it was her government that signed the Maastricht Treaty and pushed the UK further into the hold of the European Union that controls much of our law and life to this day. Tony Blair's reformation of Labour into "New Labour" led the party to multiple electoral victories but it also ended any real choice in UK politics as all major parties are now based in the centre ground fighting over small changes to very similar policies. The only real choice comes from voting for smaller parties like UKIP, the Green Party, Arthur Scargill's Socialist Labour Party or any other smaller parties which take polarising views on how the economy should work and society should be run. Views from total liberalisation, freedom, total state control and even communism. Political Parties like this are too small to gain national traction and they create a massive disenfranchisement of the UK voting populace, many of whom show their frustration at the big 3 by refusing to vote at all. However, whether you loved her or hated her Maggie Thatcher was one of the most dominant personalities in UK politics over the last few decades and her death has been marked by sadness as well as parties. For example, on news that Thatcher had died multiple parties broke out all across the UK from Scotland to Brighton people took a chance to celebrate and sing the song "Ding Dong The Witch Is Dead!" 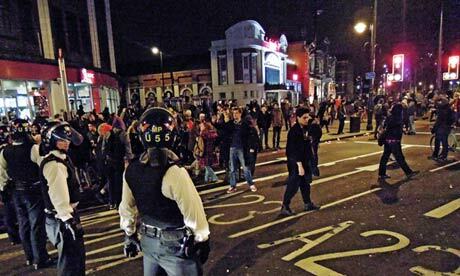 From Glasgow to London and Brighton and cops were injured and arrests made as protesters held street parties in cities across the UK. One officer was taken to hospital and five others were injured in clashes in Bristol after a street party turned violent. A man was arrested after revellers refused to leave the street party, and threw cans and bottles at police, according to Avon and Somerset police. A police vehicle was damaged and an officer remains in hospital. His injuries are not thought to be serious. Police said the group "refused requests to peacefully disperse", leading to the use of shields and batons by officers. A spokeswoman said police received a number of calls from residents about the party. She said party-goers were "throwing stuff around and starting fires" before police arrived. In Brixton, south London, people gathered from around 5.30pm in Windrush Square and by nightfall had attracted about 200 protesters after a party was announced on Facebook. The Ritzy cinema was festooned in banners, with the now showing sign rearranged to spell out "Margaret Thatcher dead". 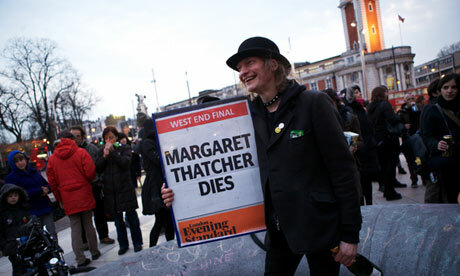 One banner read: "Rejoice, Thatcher is dead." Others chanted: "Maggie, Maggie, Maggie, dead, dead, dead." In Leeds a group gathered to hand out "Thatcher's dead cake", singing and cheering at one of several street parties. In this footage from YouTube.com a man is seen chanting 'If you all hate Thatcher clap your hands' into a megaphone. While in Liverpool, where many reviled Thatcher for her role in the closure of the city's docks and her perceived role and views on the Hillsborough disaster, there was a gathering lit by red flares on the steps of Lime street station. Police said they had not been called to any disturbances in the city related to the former prime minister's death. 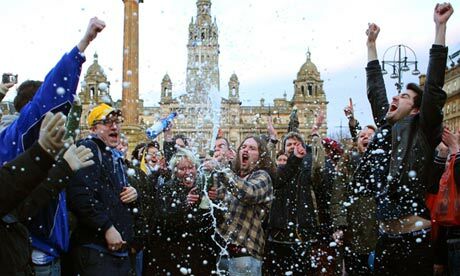 Around 300 people gathered in Glasgow's George Square which experienced highly charged poll tax protests in 1989, after the introduction of one of Thatcher's most divisive measures. Revellers wore party hats, and popped a bottle of champagne while streamers were thrown into the sky. Groups such as the Communist party, the Socialist party, the Anti-Bedroom Tax Federation and the International Socialist Group were joined by members of the public. Martin Chomsky, the lead singer of Chomsky Allstars, performed his song So Long Margaret Thatcher in George Square. "There are mixed emotions. I was never brought up to celebrate anyone's death but the pain she brought to Latin America, Europe and around the world should be remembered," he said. "I would rather that Thatcherism was dead because she is mostly to blame for what is going on today. She is responsible, but not solely, for the massive gap between the rich and the poor." In Derry and Belfast, there were republican celebrations. In one incident in Derry a petrol bomb was thrown at a passing police patrol near Free Derry Corner during a street party. In the Falls Road area of west Belfast, car horns were sounded and champagne bottles cracked open as hundreds gathered to wave flags and chant. 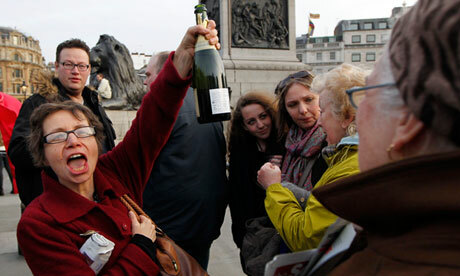 In Trafalgar Square, central London, champagne bottles were passed around as people celebrated, while a Facebook group is calling for another celebration in Trafalgar Square on Saturday from 6pm. A separate campaign has been launched to make Ding Dong! The Witch is Dead reach No1 in the music charts. View the Facebook protest page to make Ding, Dong The Witch Is Dead No 1 in the UK Charts this week on Facebook.